Following on from my previous AWS exam experience post for the AWS Certified Developer Associate (CDA) exam from Amazon, the following describes the study materials I used towards the exam. As a reminder, this is my second AWS exam, having completed the AWS Certified Solution Architect Associate exam earlier this year. As such the materials I used to study towards the AWS Certified Developer Associate exam are more sparse, due to the level of knowledge I already have. For a really full picture of all of the materials I’ve used over the last 12 months, I highly recommend you check out the Certified Solution Architect Associate exam experience and the Certified Solution Architect Associate study guides, along with a number of tips, tricks and gotchas I have posted over the past few months. I also did a podcast recently with Scott Lowe on the subject of learning AWS. If you are new to AWS, I highly recommend you check it out! This is always the go-to document for almost any current industry certification, and should be used as your primary guide for resources and areas to study. In the case of the AWS Exam Blueprint, they actually direct you to specific white papers to review as well as the content areas to study. ACloud.Guru AWS Certified Developer Associate training course. The course has around about 10-12 hours or so of content, but I would say it took me 15-20 hours in total between all of the lab work, coming up with my own scenarios to practice configuring different elements, completing the quizzes, and researching any areas where I got a quiz answer incorrect or wasn’t sure of the reasons for a specific answer. Ryan also speaks quite slowly and very clearly, so I find that watching it at 1.5x speed or above can help get through the videos on the areas you know well already. Remember to slow it back down for new content areas of course! Myself and a number of colleagues completed both of the 3 day architecting courses (standard and advanced) in a rather intense, but very informative 5 day week! This was an awesome course, and really helped my gain breadth and depth of knowledge, but I would not say it was critical to passing the Developer exam itself. 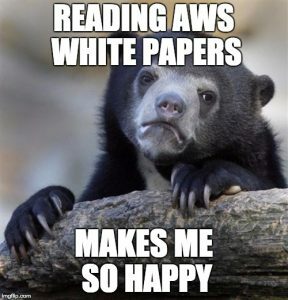 The AWS white papers are a great source of information, though they can be a bit dry at times. I highly recommend using them to augment any particular areas you feel less confident in. See my AWS CSA guide for a list of which to read. I would say this is a good indicator of the level of difficulty of the actual exam. I say this about every single exam I have ever taken – lab it, lab it lab it! It is a million times easier to answer a question based on something you have actually done yourself! Don’t try to just learn the theory, spend a bit of time doing it in practice and you will reap the benefits in both the exam and real life!